In our Crossroads series we discover how to navigate the various crossroads of life. Daily we’re faced with choices from the simple to the complex. Looking to God we find the strength to choose life and live out his very best for our lives. Through prayer we can successfully navigate the crossroads of life and follow God’s will for our future. The great thing about the crossroads we face is they can lead to a new lease on life and that was certainly the case at the crossroads of The Resurrection. In the third and final message of our, Crossroads, series Pastor Paul explores the crossroads of The Resurrection and it’s impact on our lives. At the crossroads of The Resurrection we discover a new beginning , a fresh start and a new life. In the second message of our, Crossroads, series Pastor Paul explores the example of Christ as he navigated the crossroads of the Garden of Gethsemane. 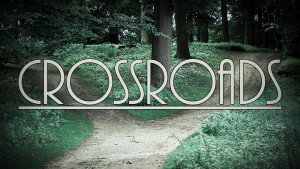 In the first message of our, Crossroads, series Pastor Paul speaks about the choices we face at the crossroads of life. God offers us life instead of death, blessings instead of curses.